We’re thrilled to follow-thru on our promise to host a private conference call plus Q & A with Michael Maloney this Thursday, April 28th for those who purchased The Elevation Group from us last December. Webinar details have been emailed to your inbox. Look for that email and immediately register. Michael Maloney is another one of the primary experts that Mike Dillard features inside The Elevation Group and he’s also Robert Kiyosaki’s personal investment advisor on gold and silver. 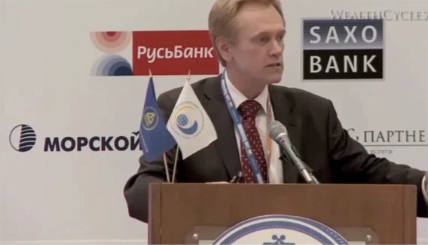 Michael Maloney recently speaking at the 8th Annual Russian International Banking Conference. He’s also considered one of the world’s leading experts on wealth cycles and global currency systems. Michael normally charges $20,000+ to speak so it’s very difficult to put a dollar value on this call. He’s the “inside guy” for some of the world’s richest investors and when it comes to investing, having the right information at the right time is priceless. But, as Michael and Mike Dillard will be the first ones to tell you, Michael’s specialty is actually not precious metals, it’s wealth cycles. You won’t want to miss this exclusive webinar with Michael Maloney. Why have gold and silver risen so dramatically over the past decade and continued flying while other asset classes have languished? How high can gold and silver prices go? In this cycle in the economy, what is the most effective way to accumulate savings? What is the best way to protect your pension? What would be the quickest route to wealth? How to know when the precious metals bull market has peaked? What is the best exit strategy? What lies ahead in the economy and how to ride the cycles to invest for massive gains. This event is being put on by Ann Sieg and 80/20 Marketing Inc, and if you have any questions or need help with arrangements, please send them to support@therenegadesystem.com, rather than The Elevation Group customer support. Looking forward to the info here. Something I’ve been interested in for years and I appreciate what you, Mike Dillard and Michael Maloney are doing to get the word out. I got to listen to Dillard’s speech at No Excuses II that highlighted some very interesting facts as well as previous trends on these topics.